Adaptation: Kono Bijutsubu ni wa Mondai ga Aru! Kono Bijutsubu ni wa Mondai ga Aru! or also known as Konobi was one of the best animes I have ever watched in my lifetime. My heart went doki doki a lot lol. I bet many people thought this will become the romcom of the season, I did personally to but it's just a goofy show overall. The story is something certainly I don't complain about, because the comedy and art always makes up for it. I just thought it kinda slow-pasted and a little boring at times. The art was amazing. very fitting for the anime. Character designs worked well because it was very lighthearted and also the studio made the most important scenes have the prettiest colors. To include in this, I loved the music as well. The music is so different from most anime openings I listened to. The voice actors made the voices sound really good to. Now the characters were somewhat relatable, and because of that I loved the characters a lot. Collete is the funniest character lol. Overall, I think anyone would enjoy a comedy and kind of romantic anime so please give it a try. Sometimes, a strong character cast is really all an anime needs to be successful. Kono Bijutsubu ni wa Mondai ga Aru (or Konobi for short) is a perfect example of an anime which technically doesn't do anything particularly different from your average romcom, but it accomplishes what modest goals it has with flying colors. We have a standard middle school club setting and barely any plot development to speak of; the show is simply about the everyday events the characters experience in their lives, and their interactions with each other. No more, no less. But with characters as interesting and likable as these, and some good laughs to go with them, that's really all you need to still deliver a very funny and entertaining anime. The story mainly takes place inside a quite typical middle school art club room. What are not quite so typical though are its members. Uchimaki Subaru may be a very talented artist, but contrary to what you'd maybe expect, he's not very interested in drawing apples, statues or landscapes. The only thing he's interested in drawing... is waifus. Perfect. Uchimaki is like a tongue-in-cheek representation of what people like to joke around that the average anime viewer is like. He's very devoted and serious when it comes to his waifu drawings, he claims to not be interested in 3D girls at all since they're impractical and "incomparable to 2D greatness", and he even gets into trouble with his schoolwork because he's too busy watching 30 episodes of seasonal anime every week. I'm sure a lot of the viewers can relate to at least some of those things, and the ways Konobi sort of breaks the fourth wall time and time again is part of what makes it so amusing to watch. At the same time though, Uchimaki's world views are much to the dismay of his fellow club member Usami Mizuki, who doesn't have any interest in anime at all and thus finds his drawings to be in rather questionable taste. But at the same time she also finds out that he is a very kind and easily approachable guy on a personal level, and she just couldn't help but fall in love with him over time as a result... however since Uchimaki is only interested in his waifus rather than noisy 3D girls, she's in a pretty tough spot. A spot which Konobi also makes great use of to be a consistent source of really great comedy. Especially since Usami's feelings are clear as day to literally everyone other than Uchimaki, and they never stop making fun of her for it. Then there's the resident oddball duo consisting of Imari Maria and Collette (family name unknown). Maria is the only one whom Uchimaki can converse openly with about his interests, as she's the only other character in the show who's also into anime and manga. In a certain way she's even more hopeless because she's seemingly gotten quite a bit of chuuni fever from it as a result. Though unlike your typical chuuni girl, Maria doesn't really play her character straight but rather it's more like an occasional chuuni act she just pulls out because she thinks it's fun. She doesn't appear to be too delusional on the inside, but for some reason likes to act like she is. Collette on the other hand... where do I even start; this girl is borderline incomprehensible. Everything she does seems completely random and not properly thought through, like a little kid with way too big of an imagination. She also wants to be a super hero, so naturally seeing Maria's confident chuuni act was like finding the person she always wanted to be herself, and thus she wastes no time at all in asking to become her apprentice. And so we end up in a situation where a pretend-chuuni girl tries her best to teach an underclassman how to become a real one. You don't see that every day. There's also the (nameless) president of the art club in there but there's not a whole lot to say about him because his shtick is basically just to fall asleep wherever and whenever possible, and never actually contribute anything useful to the club. It's a very simplistic show at heart, mainly consisting of shorter skits (about 5-10 minutes each) and not much actual plot progression. But honestly it doesn't have to be anything more than it already is. Just seeing these characters live their daily lives and interacting with each other during it is more than enough to provide a solid anime, simply because of how likable all of them are and how good the comedy is. There are a lot of meta cultural references taking jabs at modern anime fans (all in good fun of course) as well as a lot of more traditional romcom elements that are used quite tastefully. I should probably mention though that any romance fans out there might be disappointed in hearing that there is almost no romantic progression between Uchimaki and Usami at all in this anime, but you only need to watch a few minutes of it to figure that out on your own. It was never going to happen because that's not actually what Konobi is about. It's an infatuation used solely for the sake of comedic effect, not feels. Poor Usami. It may be a very "standard" anime as a whole, with a common setting, normal animation quality and soundtrack usage, and no real plot progression to speak of. But the only thing an anime of this nature really needs in order to blossom is likable characters and generally good comedy, and that is exactly where Konobi's strengths lie. And as a result this was definitely one of the shows I was looking forward to the most every week this season; it's just so much fun to watch every time. Kono Bijutsubu, or "This Art Club Has a Problem!" When perusing the new stuff coming in 2016, I was really excited for this one. I'm a huge Chunibyou fan, and seeing the art was similar was pleasing. It doesn't take much to draw a lot of Chuunibyou comparisons based on archetypes and character design. However, even though there's a girl with Chuni in Kono B, it's story is its own and no where as serious or life-defining, but instead is much more about a girl with a crush on a guy who only digs anime chicks. It's very much "adventure of the day", with no intermixing plot elements to bind the story, other than a girl crushing on a guy who likes waifus. In some anime, there is basically 0 plot development. This is one of them. Where you start is where you end. If you like that sort of thing, where no one gets too heavy and it's all in good fun, you might be a fan. I prefer a bit more of an unfolding story. I love the Chuuni art style, and this copies it perfectly. In fact, a few of the characters could just be pallet swaps, to be honest. Still, this is my favorite type of color saturation / animation / art style. If you like softer and more colorful, this will do it for you. The last episodes animation is amazing. The opening score is kind of average. The end score is good but with weird visuals. The VA's are all great fits. The teacher is cute. The boy is different. The main girl is crushing on the main boy. No one so far has any surprises or value other than whats on the surface. The more anime I watch, the more I prefer characters who are more than a trope. This so far is the shows only real shortcoming. -Subaru, a love-oblivious kid who dislikes "3-d" women and spends his time drawing waifu. - Mizuki, a generic-on-purpose protagonist who loves Subaru, but is ignored by him. -Collete, a french student left behind by her parents. She's "the weird one." and basically Dekomori with a haircut. A little later on, a new cast member appears, who shares many interests with Subaru, which annoys the crap out of Mizuki. She's also got 8th Grade Syndrome, refers to the "Black Flame Dragon", and is basically a bridge of concept between this show and Chuunibyou. Sensei Yumeha is also a thing, but she's relegated to oppai fan-service. It's a good "smiling" kind of a show and one you can enjoy. You -know- how most episodes will end, but it's nice to watch it happen and generally the things they try to make cute, are in fact very cute and it's pretty funny. I genuinely laugh about once or twice an episode. Art Class is an anime worth watching for some and will be incredibly frustrating for others. The art is great even if the substance is thin, it's tropes we like watching over and over. It tries really hard to draw from other works, and ends up feeling like a weak copy. It's a good production value kind of show, but it's very predictable and really nothing new from any other anime that's slice of life with an unrequited romance. ++: If you like the Chuunibyou art, you'll like this art. +: Good for slice of life without a huge cast. +: If you like low-drama. +: Is generally pretty funny. - - : If you want something thought provoking, like Chuunibyou. - - -: If you are tired of tropes. - -: 0 plot progression. Hi there,i decided to do a review of a romance/comedy anime called:Kono Bijutsubu ni wa Mondai ga aru! or on English:The art club has a problem!I decided to put in a tl;dr for each score next to it.Let's get right into it,shall we? Story:7/10 Hilarious plot at first,kind of falls off later. 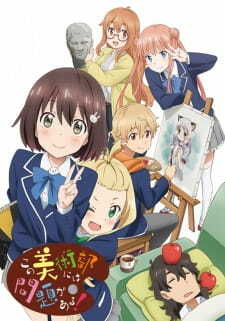 It was interesting to say nonetheless,i really liked the idea of Subaru being into 2D girls and that he is in the art club so he can draw them,other than that the story is pretty bland,they go on with their daily lives and there is absolutely nothing wrong with that,each of the episodes are interesting. Art/Animation:9/10 Beautiful,colorful and very original art style. Holy the art is amazing,each of the characters has unique looks,but still fall in the same art style.It is colorful and just a delight to watch,the animation was alright,nothing amazing. Sound:8/10 Opening/ending are great,other songs could have been better. Not much to say,i love the opening and the ending,they are very catchy,but other than that the soundtrack is not very memorable,it is good enough,better than most other romance/comedies. Comedy:10/10 This doesn't count for the overall score,it was hilarious. This is just an add-on,and it doesn't go with the overall score,but i wanted to just mention it.The whole anime is hilarious!the characters are funny,the comedy doesn't feel forced and goes well with the characters' personatilies. Characters:10/10 Funny,clever and fun to watch. Oh boy,the characters,they are the best thing about the show!All of them are original and funny,they are well done and each one of them fits their role.It wasn't the best development in the world,but it was a pretty good one.There was not a single character that i didn't like. Enjoyment:10/10 this and the characters alone are worth the watch. As i said earlier,it has some great comedy,it never gets boring to see what they are doing next,this comes from someone who was watching the show when episode 1 aired. The show did have some problems like the conclusion which was satisfying,but not exactly what we wanted though.I can't recommend you enough this anime if you are a fan of slice of life/romance/comedies,even if you are not i think you are going to like the characters and the comedy,it was brilliant,for those who seen the show and wonder why i gave it a 8.6/10(which falls into the category 9/10) and saying stuff like:you are overrating it.Well,maybe,but hey!that's just my opinion and it shouldn't offend anyone,if it did offend someone i kinda feel bad but those people are just wasting time,and should focus more on enjoying things rather than hating on them. Conclusion:If you read my whole 511-ish words long review(i don't think i counted the exact right number,somewhere around 511)i am really grateful,i was kinda feeling depressed recently and this anime really helped me,and hopefully this review will make you give this anime a shot!also +71(582-ish words in total) words for this conclusion part,see you next time,guys,this was a really fun ride.